Typhoon Pepeng will hit the northern regions of the Philippines in the following days with more winds than rainfall. This fact must not be taken lightly, however, as the gathering strength of the storm can still put people at risk. It's a reminder for all to prepare for the new threat as early as now. Typhoon Pepeng, internationally known as Parma, may intensify this coming Friday up to Saturday with winds jacking up to 241kph as it enters Northern Luzon. Storm Signal No. 1 has already been declared in the Bicol region by PAGASA (Philippine Atmospheric Geophysical and Astronomical Services Administration). Although Metro Manila will experience less rain, it may still prove dangerous as heavier rainfall from up north may cause waterways to swell. Eastern Samar is now experiencing the brunt at 175kph to 210kph. Northern Luzon will face Pepeng most likely on Saturday afternoon, October 3, in its super typhoon intensity at 240kph. 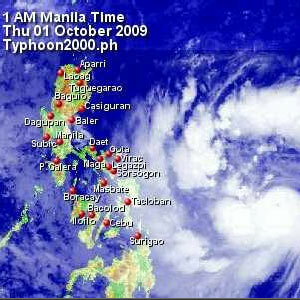 PAGASA has announced that it will post updates every two hours.